I am so excited! Through the convoluted twists of fate, a good friend of mine who is a semi-professional photographer, and a connection made through him, I am getting a new/used camera, as in new to me, but gently used by the previous owner. I've been complaining to my friend for probably two years that my pictures for my jewelry just are not all they could be, and he's told me time and again that a point-and-shoot like my little Canon Sd700 isn't going to give me the sort of shots I want - sharp, macro, colorful images. They're okay for what they are, but I see other jewelry artists' photos and know they could be better. Anyway, I've had many a long conversation with my friend about what I'd need, but the short answer is, a digital SLR camera and some different lenses, which no way can I afford right now. While most photo hobbiests and pros go for Canon or Nikon, my friend swears by Pentax. He's played with them all, and he says his Pentax gives him just as good a photo as the other two brands, but for whatever reason, the company does not choose to spend $$ on advertising the way Canon and Nikon do. The plus being, you are not paying for that advertising when you buy the camera, meaning the camera's are slightly more affordable. But let's face it, still outside my price range. Which, being currently unemployed, is zilch. However, I've still talked with my friend when we've seen each other, and he's taken the time to let me play with one of his 35mm cameras taking some simple macro shots by turning the lens around backwards. (I know, it didn't make sense to me, either.) Yesterday he was over here again, and we talked some more. He let me know Pentax had come out with an entry level DSLR he thought might be good for me (the K-x), as I could find a body for about $500 if I hunted around. This is still too rich for me right now, sadly. He said my other option is to find a good older model, used, which could be had for anywhere from $300 on up depending on how old I wanted to go. Me being me, I did a bunch of research and found some forums and talked to some people about what I would need, and I ended up making a deal on a couple years old model, in trade for some jewelry! It is in fact the very same model my friend uses, so he should be able to help me if I get totally lost or stuck! 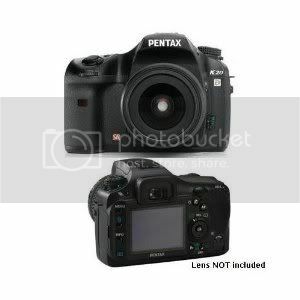 Very soon, a Pentax k20d will be mine! 14.6 megapixels to replace the 7 I've been using for the past several years. My friend is setting me up with extension tubes, and the camera is coming with a vertical grip (extra battery) and a fixed 50mm lens that my friend says will work great for what I want to do. I wasn't even really looking for a camera right now. I just knew eventually, I would need to upgrade, and I was researching with that eventuality in mind. My little Canon's been great for like five years, but it has its limits, and it's getting kind of old. I used my sister's new Powershot this past weekend for Rosalia's birthday, and I was totally impressed and jealous at the photos it took, and that was just a newer point-and-shoot. This whole DLSR thing has just kind of fallen into my lap, and while I'm ridiculously excited, I'm also pretty intimidated. Honestly, I am a little worried this is too much camera for me. My picture taking skills are pretty terrible. I don't even mess much with my Canon settings, and the whole point of a camera like this is the customization it allows the user. But playing around with my friend's 35mm and lens has been pretty neat. I don't know. It has a completely different feel than my pocket camera that is just....fun. It's hard to explain. For someone who takes crap pictures, I'm pretty excited to get it and play, and I'm already planning how to pack it to Disney in March. I'm playing with the idea of adding foam inserts to my purse. I did that to a gym bag for Mark's big video camera, as any of the pro bags for it were stupidly expensive, and it worked out really, really well. It also doesn't (and wouldn't) look like a camera bag, which makes me feel better as far as potential thievery goes. Let us know how you like it when you've had a chance to play for awhile! Oh, new washer and dryer! I want a set of those, but as you say, expensive. We keep muddling along with our twenty year old Maytag set. They mostly work fine, except they don't seem to rinse black clothes thoroughly. I still want to do that for the XBOX brain. Yes, but I want something to carry around Disney that has my camera and my money, but doesn't look like a camera case. I could probably achieve that with some foam and fabric...which I'm going to buy in any case to make an insert for whatever purse I have. Hmmm. I have an even earlier pentax model and it works amazingly! I think you'll be very, very happy with this purchase. Congratulations! Maybe you could give me some lens recommendations. :) I hear one of the cool things about Pentax is you can use all their old lenses, too, and sometimes they are much cheaper than the modern equivalent.